The cookie settings on this website are set to ‘allow all cookies’ to give you the very best experience. If you continue without changing these settings, you consent to this - you can choose to have your computer warn you each time a cookie is being sent, or you can choose to turn off all cookies. You do this through your browser settings. ach phase of the buyer’s journey requires its own specialized marketing approach. Harnessing the power of effective advertising that targets clients who are in different stages of their journey towards purchasing a treatment or product is critical. Nowadays, social media has irrevocably transformed the face of advertising. According to Aesthetic Medicine News, many patients source information about cosmetic treatments from social media. An extensive survey of US and UK consumers also discovered that 78% of consumers make a purchase based on a brand’s social media presence. Utilizing the power and potential of social media is critical to building your business. However, to use social media effectively, you need to be familiar with the platform in question to ensure you are using it correctly and maximizing its potential. Social media marketing requires time and commitment: you will need to respond to patients’ comments and questions in a timely manner, and update content frequently, prepare your content carefully, and then adapt that content for social media to educate your clients, share fascinating news, and display new products or treatment breakthroughs. Successfully harnessing social media as a marketing tool requires you to determine what your clients appreciate most about you, and also what sets you apart from competitors. Two of the most prominent and effective social media marketing tools for aesthetic clinics are Facebook and Instagram. Here, we will show you how to maximize your use of these platforms, and harness their unique attributes to target buyers in various stages of the buyer’s journey. For small aesthetic businesses in particular, Facebook is an essential component of any marketing program. If you are just starting to dabble in social media, Facebook is the place to begin. Some of Facebook's unique strengths include its versatility: you can post videos, images, links to blogs on your clinic website and include write-ups and bios about your staff. It is also customizable to suit the needs of your clinic. But how do you become an effective Facebook marketer, and moreover, how can you use Facebook to target buyers at each of the three stages of the buyer’s journey? 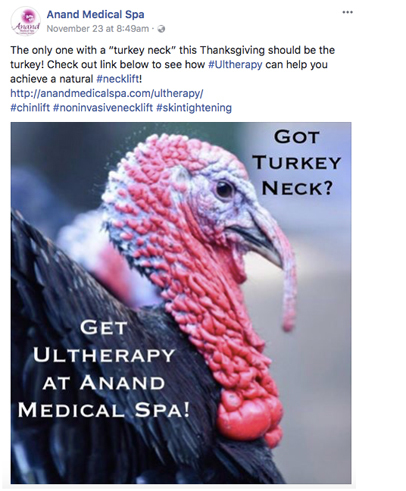 Consider this stand-out post from Anand Medispa in New York which offers the reader insights into the ways in which Ultherapy can help treat sagging skin in the neck area. This post is perfect for hailing buyers on the first stage of the journey (the awareness phase) who have identified a problem and are seeking more information to help them to determine a solution. 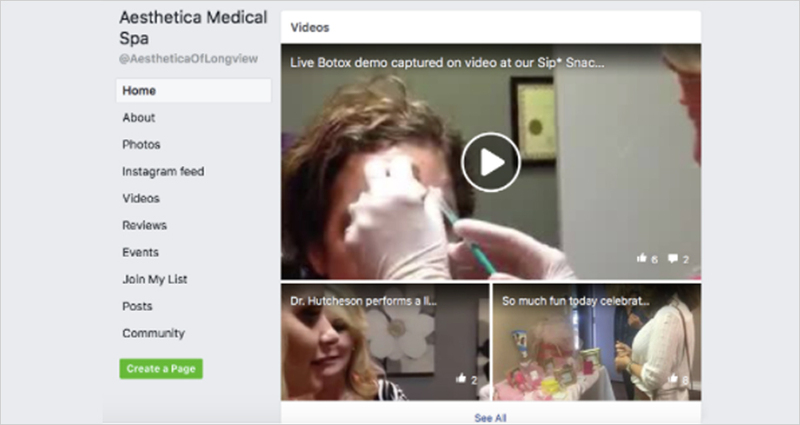 Educational video posts such as this one from Aesthetica Medical Spa are ideal for targeting buyers at the second stage of the buyer’s journey, the consideration stage. In this second phase, the buyer has developed awareness of an aesthetic problem that they would like to resolve, and is looking for further expert content to help them consider a solution. Videos are engaging and an easy way for prospective clients to absorb information. In the case of the Aesthetica Medical Spa link provided below, this specific video allows greater insight into Botox from a patient perspective, as well as what they can expect during the procedure. Use Facebook to re-post factual and engaging articles on your page to position your brand as a source of information and expertise, and increase your following in the process. Post up to five times a day so that you remain at the forefront of your followers’ minds. Award-winning Motykie Med Spa in L.A. posts links to educational blog pieces and articles such as this one below to appeal to buyers in the second stage: the consideration phase. Informative content that is abundant with insights from experts can help buyers refine their choices for possible solutions and help move them towards a decision. 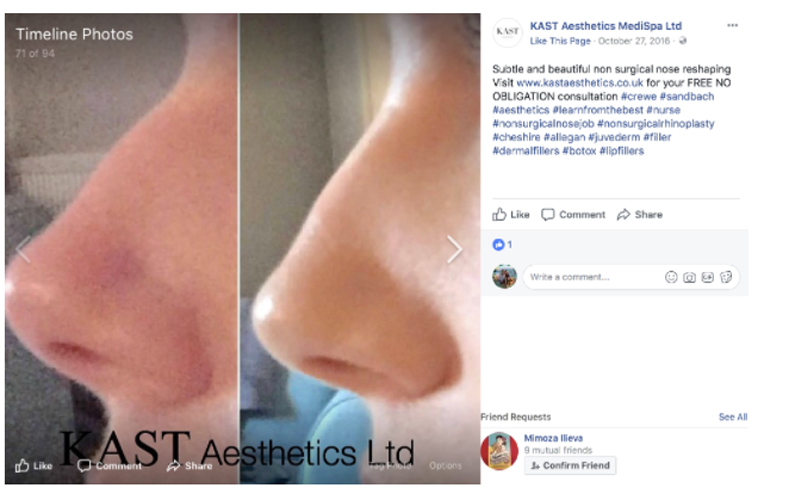 As another example, Kast Aesthetics, posts highly informative posts profiling new products on a daily basis and demystifies the way that particular treatments work using high quality content and before and after images of clients. Case-study style images such as the one below are particularly effective in targeting buyers in the second stage of the buyer’s journey. 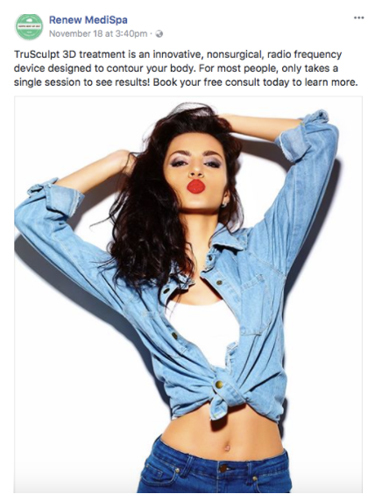 Check out this striking post from Renew Medispa inviting clients to book a free consultation for Trusculpt treatment. This post is concise, punchy and extends an invitation to the reader in the form of an offer. It would therefore work well to entice buyers in the third stage of their journey: the decision phase. The caption reads, “For most people, it only takes a single session to see results.” What this post is effectively doing is overcoming a potential objection. If results are almost guaranteed, the potential client has less space to contest the efficacy of the treatment, and more impulsion to try it. Are your social media posts overcoming objections? Instagram attracts a younger demographic than Facebook with the average user most likely between the ages of 16 and 24, with a 56% female majority - an audience that could be prospective aesthetic clinic patients. Moreover, it is perceived as one of the more trendy, youthful and creative social media platforms. Instagram’s strengths lie in its immediacy, simplicity and apparent authenticity. 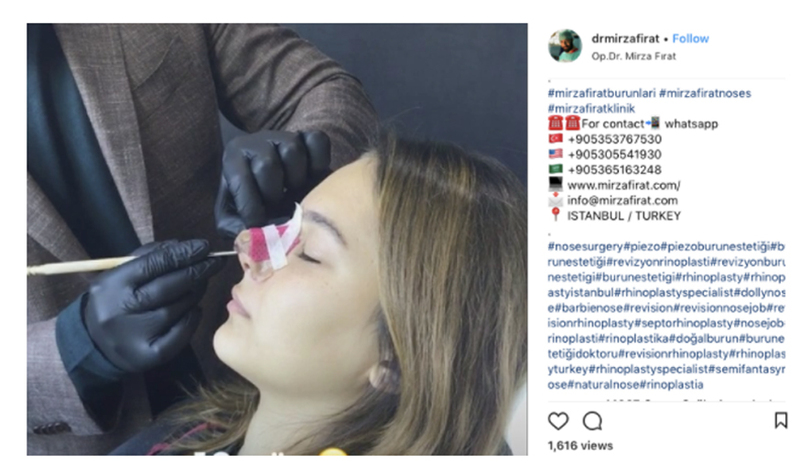 A platform for images and stories that can be uploaded and posted almost instantaneously from a mobile device, Instagram represents an invaluable marketing tool for aesthetic clinics seeking to expand their reach. Much of Instagram’s usefulness lies in its marketing appeal to buyers approaching the ultimate decision phase of the journey; they simply need the last little push to make a purchase, and an appealing offer, trial or consultation may help them to do so. The visual aesthetic, branding, number of followers on your Instagram account and frequency of your posts can strongly compel a potential buyer to settle on your clinic for their treatment. Instagram posts reach a far greater audience when you add as many relevant hashtags as possible to the images and videos you upload. There are sites available online to help you determine which hashtags are most prevalent and relevant. Studies show that Instagram posts that use hashtags get a higher number of likes and comments. According to Track Maven, a post with 9 hashtags will perform 2.5 times as well as a post using only one hashtag. If you are unsure about how to create relevant hashtags, there are hashtag generators available online such as this site https://www.all-hashtag.com/ which shows the top ten hashtags for any keyword you type in. Take a look at this video posted on Instagram: within two hours of being uploaded the video already had more than 1,616 views. 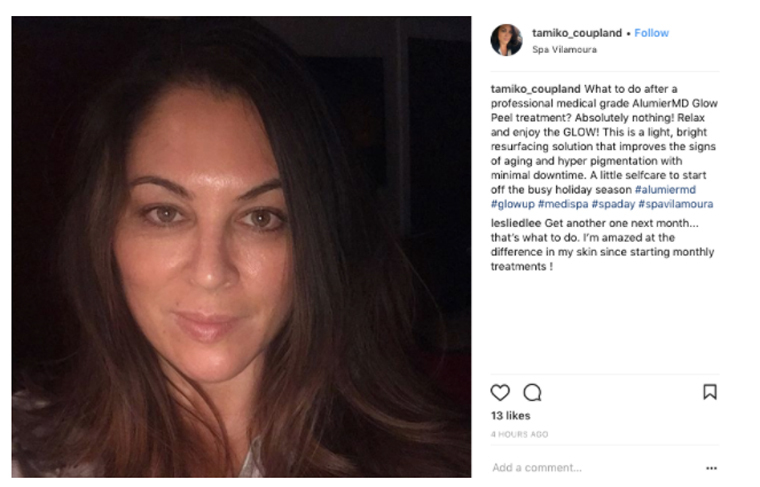 Instagram is the perfect medium for posting before and after pictures of patients to showcase the efficacy of your services. You can even re-gram user-generated content such as images and videos provided by regular users. For example, a patient can post a photo of their lips before and after a filler treatment, then tag your clinic in their post. 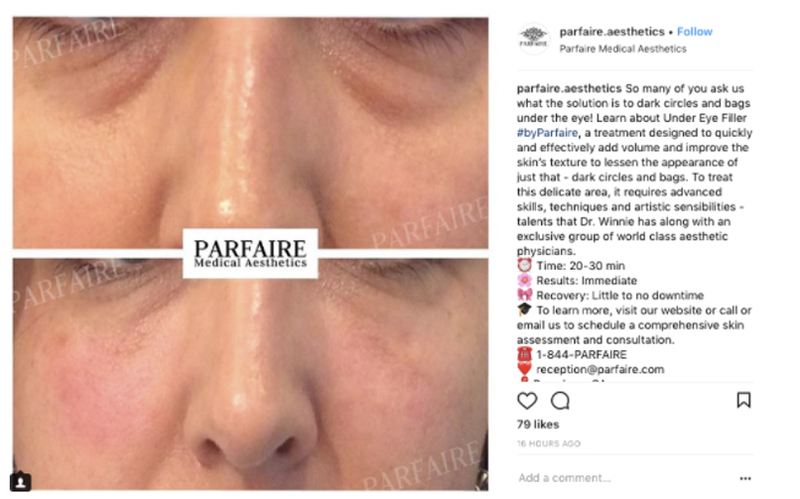 Before and after images such as the one below from Parfaire Aesthetics work as powerful motivators to move a patient from the consideration phase of the buyer’s journey towards making a decision. To gain more followers on Instagram, you need to post frequently. Up to two or three times a day is ideal, as it maintains an ongoing conversation with your audience. However often you decide to post, ensure you are consistent. Posting in random bursts does not help to build brand recognition. Find out when you have optimal engagement with your posts (for example, after 4pm or on Saturdays) and endeavor to increase the frequency of your posts when your audience is more likely to view and respond. A high number of followers carries weight, as it is seen by patients to be synonymous with credibility. While numbers may seem like vanity metrics, in the eyes of a prospective patient that have meaning and may be the deciding factor between the patient purchasing a treatment at your clinic rather than another. Parfaire Aesthetics posts captivating images and content on a daily basis and has almost 4,000 followers. This is no coincidence: frequent posts keep your clinic featured in your patients’ feeds and increase your followers. Similar to Facebook, videos represent an invaluable way to capture the attention of prospective clients. Instagram videos differ from Facebook videos, however, in that they have to be more concise and to the point as there is a 60 second limit on video material. This can actually work to your advantage since it forces you to profile treatments or products in an economical but engaging manner. Ensure you use the number of views or hits your videos receives as informal feedback for what does and does not work effectively. Take a look at some of the fascinating and highly informative video content available on the Trifecta Medispa Instagram feed. 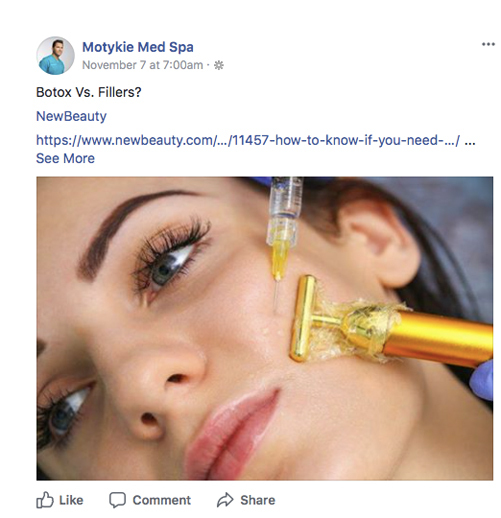 Facebook and Instagram represent the two largest social media tools, but by no means are they the only relevant platforms for creating marketing content for aesthetic clinics. As you develop marketing material to target your clients at each stage of the buyer’s journey, research other options that may be a good fit with your clinic such as YouTube, Snapchat, Twitter, Tumblr and Flickr. Each boast their own unique attributes capable of positively contributing to your online presence, expanding your audience, and gaining prospective clients. 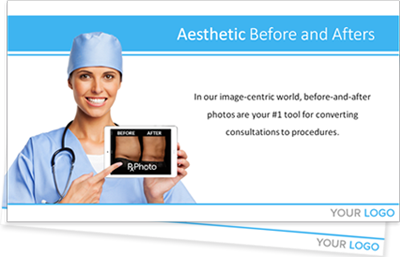 Are you struggling to showcase the great resutls of your aesthetic procedures? Clinical photography photo management and storage app for the dermatology, aesthetics, plastic surgery, vein treatment, medical spa and wound care fields. Get insider tips on turning your before and after photos into revenue.